In the last week of April I was in San Jose to attend the Storage Field Day 1. The first presentation was done by Tom Isakovich CEO and founder of Nimbus Data. His presentation was on the S- and E-class products that Nimbus offers as well as the HALO operating System that’s build from the ground up especially for an all flash storage system. NimbusData provides an energy efficient, high density, multi protocol and scalable all flash storage system. With the S-Class Nimbus has a scale-up all flash storage system, which combined with the Nimbus HALO OS can scale from 2,5 TB to 100 TB of pure flash. On the other hand the cloud-scale E-class Flash Memory System is the industry’s first fully redundant, mutiprotocol Solid State System which can hold up to 500 TB of flash. The 500 TB limit will be broken within this year though, for 1 PB+ capacity’s. NimbusData provides an intelligent and efficient 100% flash based storage platform that enables company’s to solve their storage performance problems and reduces the IOP / GB per tile ratio drastically. So the NimbusData products will boost your Storage performance, consumes much less power, is less sensitive to mechanical failure and comes with intelligent software that eases the Storage Management. NimbusData provides ISCSI, Fibre Channel, Infiniband, NFS and CIFS support through it’s HALO OS within one system. This gives Nimbus an advantage as it integrates into the common infrastructures and already supports the future ones. Nimbus created the HALO OS to be a software suite that provides end-to-end administration, optimalization, security and protection of data, and detailed monitoring of the storage system. By building the software special for an all flash memory system the HALO OS maximizes the lifespan of the flash memory and the capacity of the system, while it reduces TCO. Providing inline deduplication, thin provisioning, snapshots, encryption and replication through the GUI and the CLI interfaces complete the Nimbus system. 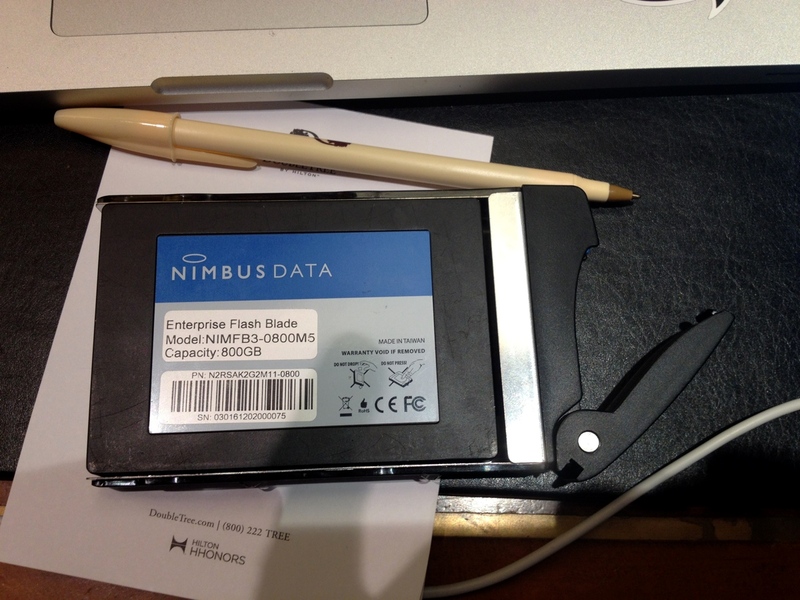 To be not just another flash storage vendor Nimbus makes sure they have one of the cards on their sleeve: making their own Solid State Drives. This has quite a few advantages. One is being able to create a 1 TB (800 GB netto) 2.5″ SSD and another is that with this they are not bound to any SSD vendor to produce updates and bigger/faster SSD’s. Question is: Is this already being used? And if yes, how does it perform? 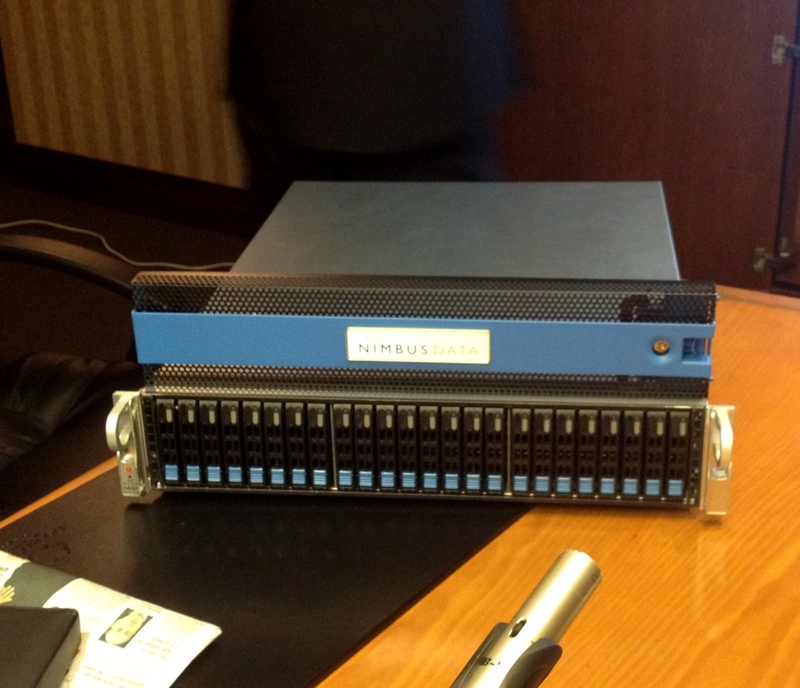 Ebay bought more then a 100 TB of the Nimbus E-class for the right performance on their VMware vSphere Infrastructure. The requirements eBay had were clear and simple: Tight integration with VMware vSphere, ISCSI connectivity over 10 Gigabit Ethernet, Ease of administration and inline deduplication to reduce storage capacity requirements. The fact that Nimbus could address all these requirements, and more, meant eBay made the choice to go for the Nimbus solution. Nimbus shows that storage systems filled with all flash modules is not something for the future, but that it is already here. The E- and S-Class systems are ready to take an organization to the next level, by providing a scale-up as well as an scale-out storage system managable by a software suite that provides detailed monitoring, administration data protection, optimalization and security and intelligent storage management suite.